" Causes for a tender scalp range from those that are minor such as using a harsh shampoo to those that require medical care such as thyroid problems, infections and skin conditions such as scalp psoriasis or seborrheic dermatitis (dandruff - most common). Dandruff causes redness and scaling in the scalp, ears, nose and sometimes central chest. Dandruff is caused by the normal yeast that lives on our skin. The first line of defense if an anti-fungal shampoo. If this doesn't work, then see a Dermatologist for prescription strength medications. Related symptoms can provide clues as to the cause such as hair loss pattern, itch and skin rash, flaking or lesions. Typically, the scalp gets dry and itchy as the result of sores, bumps, blisters, flaking, crusting and itching. Treatment depends on the underlying cause. Be sure to see a Doctor when scalp tenderness is accompanied by other symptoms such as headache, or if the condition worsens over time." Sore sensitive scalp tenderness caused by Psoriasis, which is the rapid accumulation of dead skin cells in the scalp. Hair traps the cells causing the build up of a thick plaque which makes it difficult to treat. The scalp conditions psoriasis and seborrheic dermatitis are the most common scalp problems evaluated by dermatologists and are often confused with each other. 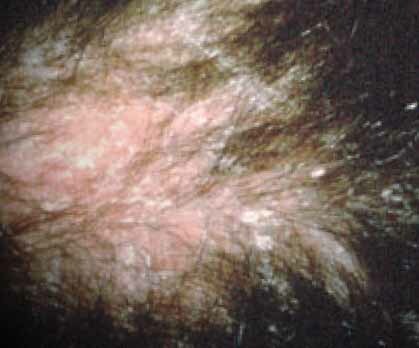 Seborrheic Dermatitis (dandruff) is characterized by greasy scales on scalp and face accompanied by itch. It occurs from clogged sebaceous oil glands. Approximately 25% of all people will have this problem at some time. It is believed to be triggered by a fungus and is more often seen in individuals with young immune systems such as infants or those with compromised immune systems such as the elderly. Weather: During low humidity months, dry air can impact the scalp causing symptoms such as itch. Treatment for this condition includes purchasing an air humidifier and keeping a home at 68F. Giant Cell Arteritis: Arteritis is an inflammation of the lining of the arteries. It causes symptoms such as tender scalp, head pain (usually temple area), vision problems, jaw pain, fatigue, weight loss, and headaches. It is treated with corticosteroid medications which can stop vision loss and address any symptoms. (4) 50% of the people with giant cell arteritis also have polymyalgia rheumatica. Occipital Neuralgia: Occipital Neuralgia symptoms, in addition to a tender scalp include a jabbing, sharp pain in the back of the neck and head. (5) It is caused by the occipital nerves, which move up the spinal cord through the scalp. It occurs when these nerves are either suffering from inflammation or injury. Related symptoms include pain when the neck is moved, light sensitivity, throbbing pain or a burning sensation at the base of the head to the scalp. Doctors will need to differentiate this condition from having a migraine. Central Centrifugal Scarring Alopecia (also called Follicular degeneration syndrome, hot comb alopecia, CCSA): This condition starts with slowly increasing hair loss on the scalp crown or top progressing to the front hairline, starting age 20 to 30. Symptoms such as scalp tenderness and itch (pruritis) are also common. The condition is seen more often in African American men and women. Diagnosis is based on the appearance of the hair loss and through a skin biopsy. Treatment is with prescription steroids. While the exact cause is not known, it is believed that excessive use of harsh hair care products and methods in the African American community can lead to this condition. Hair Care Products and Shampoo: Overuse of hair care products made with harsh chemicals (e.g. sodium laureth sulphate) can destroy hair follicles and the oil glands around them, also causing scalp pimples. Consider switching to a mild shampoo and stop using hot water in favor of warm water. Shampoos can lead to itch if it is removing essential oils from the hair, causing dryness. Chemical stripping of your natural sebum from the scalp by shampoos affect pH balance. 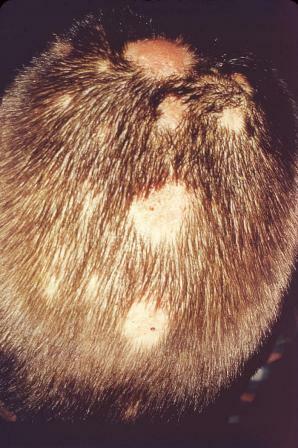 Scalp Folliculitis (chronic or severe scalp folliculitis is called acne necrotica): Scalp folliculitis when inflammation occurs at the base of the hair follicle. The condition scalp folliculitis has symptoms such as the formation of a number of small lesions or pustules on the scalp. Other symptoms include itch. The condition can be caused by mites, yeast and bacteria. Treatment is with shampoos which contain ciclopirox or ketoconazole. Doctors may also use antibiotics, steroid creams or antihistamines. Acne Necrotica (acne varioliformis): This condition is a more severe form of scalp folliculitis. In addition to papules (pimples) on the scalp, black crusts can form. The condition may also appear on the face. Yeast organisms show up when the sebum is stripped (e.g. melassesia globbosa and pitysporum ovale) Yeast causes itchy, flaking and dandruff. Scalp Ringworm is caused by a fungus and requires treatment with some type of natural topical, topical cream or shampoo. Dissecting Scalp Cellulites (perifolliculits): The condition Dissecting Scalp Cellulitis is a form of folliculitis with the formation of pustules (puss filled pimples) at the hair base. The problem is caused by skin flakes (keratin) which do not fall away from the skin properly. The result is scalp scarring and hair loss. Skin lumps or bumps when pressed may yield fluid. This is a rare condition. It tends to occur in African American men age 18 to 40. Treatment involves the use of antibiotics, removal of scars and keeping the wounds infection free. Dr. Lisa Rhodes, A professional dermatologist explains how to treat scalp tenderness, a sore scalp or sensitivity due to dandruff and scalp dermatitis. 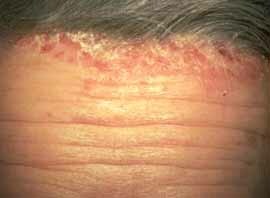 Symptoms of scalp psoriasis include silvery scales on the scalp and other body locations, usually the knees and elbows. It occurs when new skin cells are generated faster than old skin cells fall off the body. This is a process that normally takes 28 days, but in people with psoriasis, new cells are produced and come to the skin surface in as little as 4 days. These new cells bunch at the surface causing scalp itch and scales. The best rule of thumb when dealing with tender scalp is if it hurts, get it checked out. Before you go to the doctor, consider what things you know are not causing your tender scalp and tell the doctor that when you see him. For instance, dandruff will not cause shooting pains in your scalp. Think about who you have come into contact with in the past few months and whether or not they had a scalp problem or had a disease such as scabies. Tender scalp (and at times hair loss) may happen for a variety of reasons ranging from hairstyle to disease. This is why it is best to visit a doctor or dermatologist for an accurate diagnosis in order to treat your problem. Whether or not you require medication(s) to deal with your problem or may be able to use herbal or natural remedies depends on the reasons for your tender scalp. Diagnosis of tender scalp is usually done based on visual presentation, based on skin scrapings and various other tests, depending on what the doctor thinks may be the cause. For instance, if the doctor suspects ringworm, he could do a scalp scraping or use a UV lamp. Depending on the cause of a person’s tender scalp, the treatments may be as varied as the causes. Simple steps include stopping the use of hair products such as gels. Avoid shampoo ingredients that remove natural moisturizing oils from the scalp such as sodium lauryl sufate and sodium sulfate. For itch, try an over the counter product such as Scalpicin. If scalp tenderness does not respond to over the counter treatments, be sure to see a Doctor. Essential Oils: Combinations of essential oils such as chamomile, rosemary, sage and avocado when massaged into the scalp can support hair growth. Oils are available in products such as ReGrow Scalp Massage Oil. This can be a helpful approach when recovering from one of the skin conditions mentioned or to retain the hair you have. Neem oil: Mix with shampoo to help scalp soreness. Add 15 drops to shampoo. Scalp itch is either caused by dry skin or yeast buildup due to the buildup of dead skin cells (also called dandruff, the condition is referred to as pityrosporum), To treat, use a dandruff shampoo that contains ketonconazole. A good choice is Nizoral A-D.
Scalpicin drops or wipes are a medicated over the counter product that can help ease itch from minor causes such as dandruff. Ringworm may required a prescription oral medication since most ointments or antifungal creams cannot penetrate the hair roots deeply enough to be effective. You can try over-the-counter shampoos and other natural remedies, but know that scalp ringworm probably requires a trip to the Doctor. In children, the main treatment for scalp ringworm is the medication griseofulvin taken orally for 8 weeks. It is taken with fatty foods such as milk or ice cream. Natural Ringworm Remedies: A topical treatment such as Lotrimin or for a natural remedy try Naturasil Topical Ringworm Treatment. Medicated Soap: Soaps such as Naturasil Sulfur-Lavender Soap that contain ingredients such as Palm Kernel and Coconut Oil and Lavender can help to eliminate Ringworm on the body. Tea tree oil: Create your own tonic by mixing warm water with 15 drops of oil. Massage into scalp. Medicated shampoos or anti-fungal creams, such as NIzarol A-D, Selsun Blue or Zincplex. Look for ingredients such as terbinafine, clotrimazole, miconazole or ketoconazole. See a Doctor if over the counter medications do not work since you may have a misdiagnosis or the creams/shampoos are not penetrating the hair roots. Shampoos that contain ketoconazole (2%), tar or zinc are rotated. If these do not bring relief, then a Doctor will prescribe short term use of topical coritcosteroids or a mild steroid oil such as fluocinolone oil. Once the steroids are no longer needed, shampoo will be used to control the problem. The condition will be controlled in 1 to 2 weeks. Similar to treatment for scalp psoriasis, try anti-fungal shampoos that contain ketoconazole and zinc. If this does not work, other topical immunomodulatory drugs are available such as Protopic ointment and Elidel cream. As mentioned above, this tender scalp causing condition is thought to be caused by changes in scalp condition due to the use of harsh hair care methods (hot combs) and products. Therapies include the use of prescription steroid products and discontinuation of those hair care products that may have triggered the condition. Natural Remedies such as Nat mur, Kali mur, Kali sulph and Galium are homeopathic ingredients that support healthy skin and healing. A natural remedy such as Skin Dr. can be used along with prescription products recommended by your Doctor. As mentioned scalp tenderness can be due to minor or major issues. Be sure to see a Doctor if tender scalp issues do not improve or if they cause pain.